Filmstalker: Facebook to stream films for U.S.
Facebook to stream films for U.S.
Facebook is set to open up a new service to stream films to those in the U.S., not anywhere else in the world, and for upwards of a mere US $3 you can watch a title from Warner Bros. while around you you'll have all the flashing, intrusive, and awkward functionality of Facebook vying for your eye time. The first film to be offered will be The Dark Knight and will be made available to those who "Liked" the film's page, along with the three dollars or thirty Facebook credits. The news isn't that surprising really, digitally streaming films wouldn't be that far off of Facebook's offering, however I do wish they'd concentrated on making the usability a bit better before racing off into new functionality, however, personal gripe over let's get back to the story. 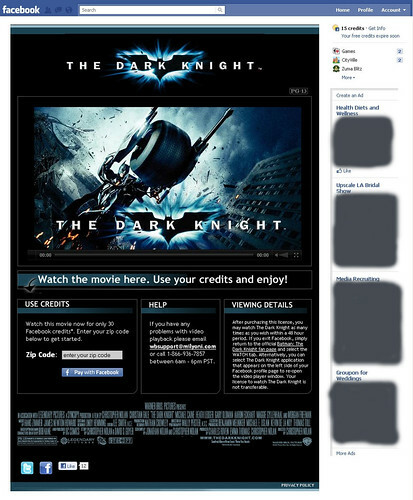 The Dark Knight (Filmstalker review) is the first trial of the service and will be delivered through your browser in the Facebook page, $3 isn't bad for a rental that apparently will be around two days. There are some mock-ups from the press release going around, and I've just pulled one down hiding all the ad spaces. I'm not sure if the film is set to play inside the window at the top or not, I presume so. Really, that's all there is in the article from BetaNews, and you can find out more on the The Dark Knight Facebook page. Warner Bros. have said that they will offer more titles in the coming months but they haven't said which titles, nor have they indicated an ongoing price range, and there's no word of other studios leaping onto the bandwagon. I think this is fine for the casual viewer and seems to work well, but for someone who likes film, having all the Facebook paraphernalia around the film while you're viewing is going to be annoying. I'd rather stick with a disc or a full screen stream thank you.